Trajan's Arch or rather the Arch of Trajan is a spectacular historical monument that was erected towards the beginning of 2nd Century AD by the senate and Rome’s citizens in Emperor Trajan’s reign. This Roman Triumphal arch was constructed so as to honour the Emperor after he expanded the city’s port using his own finances so as to improve the fortifications and the docks. The beautiful arch the work of Apollodorus of Damascus, a Syrian architect and have been made of Turkish marble which was brought from Marmara Island’s quarries. There are inscriptions on the attic which proclaim the dedication to the Roman Emperor and Trajan's Arch truly is an impressive monument to look at. How popular is Trajan's Arch? People normally club together Chiesa Santa Maria Della Piazza and National Museum Of Marche while planning their visit to Trajan's Arch. Historical location and a reference point for anyone in Ancona it's a testimony to the city origin and history. Easily accessible for anyone passing through the harbor area it's close to the city center and it provides an important vantage point to admire the cathedral overseeing the old city area ("Ancona vecchia"). 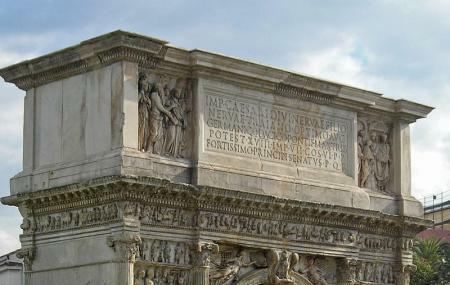 The Arco Traiano is also on a marked walk guiding visitors across the harbor area along landmarks and resting points. Will need transportation as there is limited local options if coming in to port.